Chicago (April 19, 2016) – Pastoral’s Appellation, a 75-seat wine bar and restaurant in Andersonville, today officially debuted its first spring menu. To coincide with the launch, Appellation will also unveil a new spring art exhibition from local Chicago artist, Jill Sutton, within the restaurant’s dining area. Appellation’s lively new spring menu delivers a simple, authentic approach to food and wine with a sense of place, in a warm, inviting space. The restaurant’s name and menu inspires guests to appreciate the place of origin for each ingredient and wine pairing, as well as the farmers and producers with whom Pastoral has built great relationships over time. Created by Chef Jesse Williams, who attended the prestigious Culinary Institute of America, the new menu features a range of rustic, approachable and creative cuisine. As the former head chef of Birchwood Kitchen, Chef Jesse has applied her culinary experience to highlight high-quality, seasonal ingredients accented by the cheeses Pastoral has championed for more than 10 years. The menu offers “bites” and “mains,” in addition to cheese and charcuterie plates. The menu also features libations from Appellation/Pastoral’s acclaimed wine buyer and educator, Mark Wrobel. 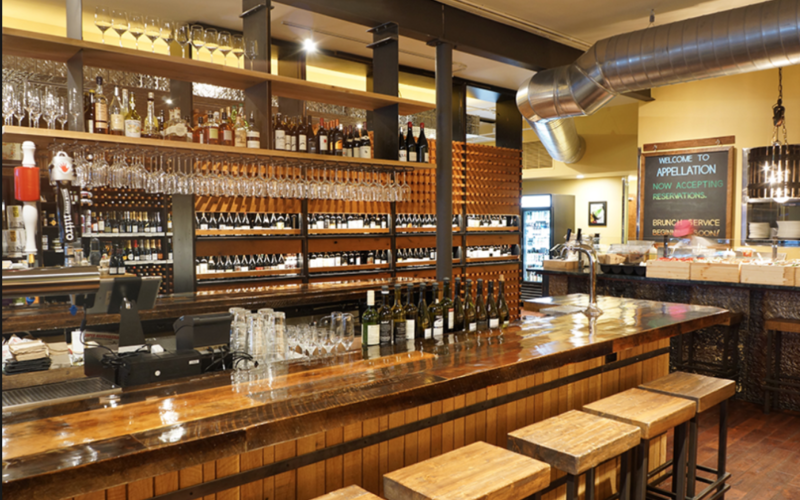 The wine bar offers 20 wines by the glass, featuring a rotating selection of small production wines from dynamic producers from around the world, including a French Rose on tap for the warm weather months. In addition to its spring menu, the restaurant recently began serving full service lunch daily from 11am – 3pm, a menu featuring quiche, cheese, and charcuterie. Pastoral is committed to showcasing unique and inspired works from local artists, which rotate seasonally. To accompany the launch of Appellation’s new spring menu, Pastoral will unveil its third art exhibit on Tuesday, April 19, featuring colorful landscape-inspired paintings from talented Chicago artist, Jill Sutton, that are also available for purchase. Pastoral will host a public art opening of her new collection with a free cheese and wine reception that evening from 6-8 p.m. The current exhibit will be featured through June. With a bachelor’s in fine art from Washington University and a master’s in fine art from California College of the Arts in San Francisco, Sutton’s work has been exhibited extensively throughout Chicago, including shows at Evanston Art Center, University Club of Chicago and Bridgeport Art Center. Currently, she is on the painting and drawing faculty of Evanston Art Center. The Bardstown Bourbon Company’s still features a unique design, incorporating large, rectangular glass manways – a shape never before used by Vendome in still manufacturing – that enables visitors to watch the whiskey moving through the distilling process. The use of glass also reflects the transparent nature of the Company’s approach to whiskey making. No secrets, mythical stories, or fabricated legends, the Bardstown Bourbon Company celebrates the craft of making great whiskey and the Bardstown community that brings bourbon to the world. 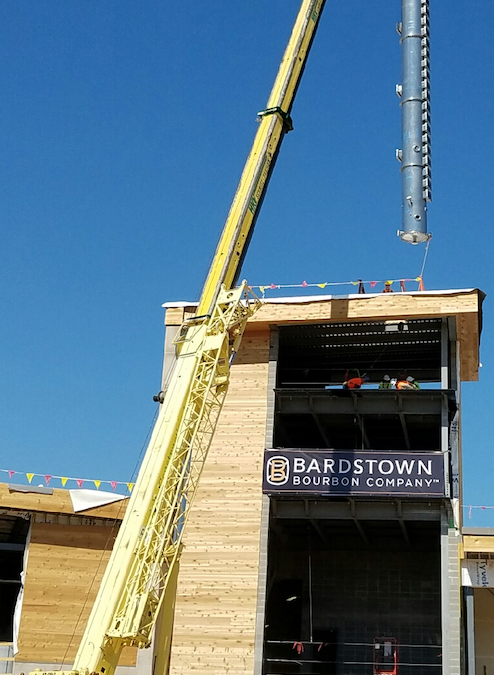 The Bardstown Bourbon Company in its current configuration has a 1.5 million proof gallon annual capacity, which can be expanded to six million proof gallons within the current design of the distillery. Under construction since October 2014, The Bardstown Bourbon Company is “the Modern Distiller of the American Spirit.” The company is developing a $25 million destination experience with a first-of-its-kind Napa Valley style campus featuring a state-of-the-art whiskey distillery, unique and transparent educational experience, high-end tours and tastings, integrated visitors center, event space, and eventually a restaurant and boutique hotel. The distillery is set to begin production in September 2016 for its own brands as well as its new “Collaborative Distilling Program,” which offers the opportunity to create custom, authentic, Kentucky whiskey, bourbon and rye and provides comprehensive barrel financing. Chicago, Ill. – (April 5, 2016) – Pastoral Artisan Cheese, Bread & Wine, together with Chicago French Market and presenting sponsor Specialty Food Association, will host the 6th Annual Pastoral’s Artisan Producer Festival, on Saturday, April 30 from 11:00 a.m. to 3:00 p.m. at Chicago French Market (131 N. Clinton Street). For those unable to attend this year’s festival, Pastoral will make the following gift collections available for purchase online at pastoralartisan.com, in-store or by calling 800.721.4781. A full list of contents in each medley is available upon request. Metra will offer an $8 pass that includes unlimited rides for the weekend. Kids under 11 ride free. Parking lot is adjacent to Chicago French Market, with entrances at 164 N. Canal Street and 165 N. Clinton Street. Limited space available. Supporting Sponsor: Zuercher & Co.
Pastoral’s Artisan Producer Festival is an annual culinary event in Chicago that gives guests the chance to meet artisan producers from around the globe, taste their products and celebrate small batch food, beer, spirits and wine. Pastoral’s Artisan Producer Festival is distinctive from most national and international culinary events of its kind because it is entirely free and open to the public. Pastoral created Pastoral’s Artisan Producer Festival as part of the company’s mission to make shopping for and consuming high-quality artisan goods enlightening, approachable, fun and delicious. 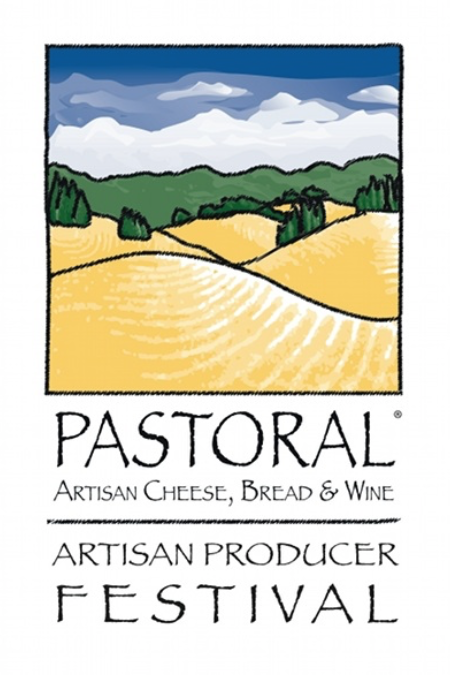 Many of the products featured at Pastoral’s Artisan Producer Festival are sold in the Midwest exclusively at Pastoral. For more information on Pastoral’s Artisan Producer Festival, visit pastoralartisan.com. Founded in 2004 by Ken Miller and Greg O’Neill, Pastoral Artisan Cheese, Bread & Wine is a group of national award-winning neighborhood cheese, specialty food and wine shops offering the highest quality, cut-to-order domestic and international specialty cheeses, freshly baked breads, perfectly chosen accompaniments and small production wines, along with hand-crafted, cheese-loving beers and spirits. Pastoral also offers custom gift collections, gourmet sandwiches and salads, picnics and catering. Pastoral is committed to providing the highest level of service and education for customers, striving to make shopping for and consuming artisan goods enlightening, approachable, fun and delicious. Pastoral welcomes customers at four Chicago store locations, and ships nationwide at www.pastoralartisan.com. The Specialty Food Association named Pastoral “Outstanding Retailer of the Year” in 2007 and 2012. The Company’s first restaurant, Bar Pastoral, opened in 2012 and is an award winning, Michelin Guide recommended cheese & wine bistro located in Lakeview’s cozy neighborhood setting. In 2015, Pastoral opened Appellation, a wine bar and restaurant in Chicago’s vibrant Andersonville neighborhood. The Specialty Food Association is a thriving community of food artisans, importers and entrepreneurs, who bring craft, care and joy to the distinctive foods they produce. Established in 1952 in New York, the not-for-profit trade association provides its 3,000 members in the U.S. and abroad the tools, knowledge and connections to champion and nurture their companies in an always-evolving marketplace. The Association owns and produces the Winter and Summer Fancy Food Shows, and presents the sofi™ Awards honoring excellence in specialty food. Learn more at specialtyfood.com.